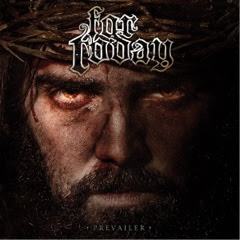 Christian metalcore heavy-weights For Today return today with Prevailer, a new EP and DVD set that comes hot on the heels of their most successful album, last year’s Immortal. The new EP released via Razor & Tie Records features four brutal brand new songs recorded with producer Will Putney (Miss May I, Suicide Silence) as well as an acoustic version of their hit single, “Fearless”. The DVD features a documentary of the band’s journey which began in Iowa in 2005 and is highlighted by personal band interviews and live performance footage that shows just how far the band has come to date. The EP which presents a lyrical concept based on the New Testament Gospels opens with the anthemic “From Zion” which explodes with a fast-paced rhythm that only slightly lets up on the catchy sing-along chorus. Ominous church bells ring to open the standout first single, “Crown Of Thorns” which is highlighted by dueling guitar harmonies and a super-heavy death metal style along with a soaring chorus and vocalist Mattie Montgomery’s unashamed and truthful lyrics. “Flesh And Blood” follows with an inspired message and a thunderous breakdown. The last of the new songs, “Open Heaven” is a cathartic plea for justice with a pit-ready rhythm and a cloud-parting chorus that mirrors the song’s passionate lyrics. The 5-song EP closes out with a pretty acoustic reimagining of “Fearless” with marching drums and steady acoustic guitar strumming that easily transforms the song into a worthy praise and worship song. For Today’s new EP/DVD Prevailer is an excellent starting point for new fans and a great document of the band for their ever-growing and loyal fanbase. Plates Of Cake - "Teenage Evil"
Free Friday: The ACBs - "Stona Rosa"